Wow! What beautiful fishing weather. Temperatures in the upper 70s or low 80s, sunny and a light (well maybe a little more in the afternoons) winds. Looks like more of the same into the weekend. By the weekend, we do have a chance of moisture, but at this time, it doesn’t look to be a big chance. Next week looks like more nice weather. Generation pattern continues to give the waders lots of wading time. The only limited wading day we have seen for a while was Sunday when they ran a lot one unit. Even this, however, didn’t hurt the fishing for those fisher who found access and fished. Saturday, Stan and Carolyn two out two couples from northeast Missouri. Stan took the guys, Pete and Doug, and Carolyn took the ladies, Susan and Terri. 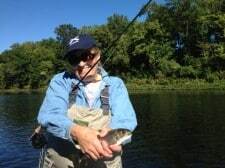 For the most part, all were new to fly fishing as it had years since Pete had picked up a fly rod. 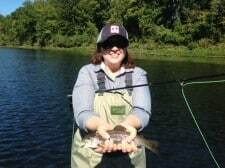 Terri and Doug had never fly fished, and Susan had thrown a rod in her back yard. What a fun, day for everyone. Susan and Terri think they are in love with fly fishing! Didn’t take long for Doug to get the hang of it and he was throwing a great line and pulling the holographic green crackleback and catching fish. 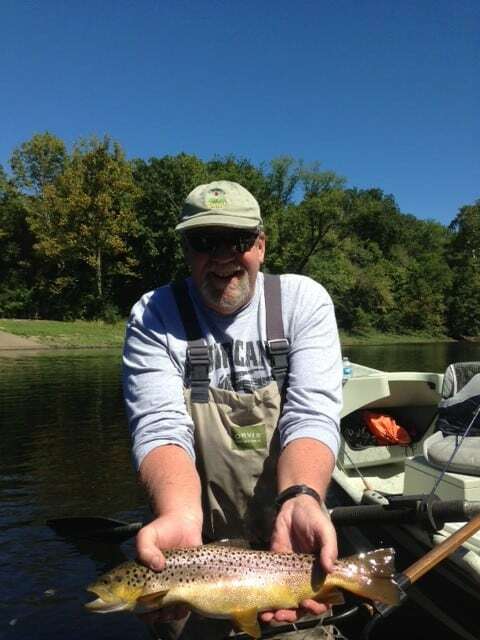 Pete hooked this nice brown on a P&P (we think) midge. The ladies were fishing the P&P midge and hooking, catching and, of course, missing fish all morning. I think we also threw in the copper dun midge for a little while when the P&P slowed down. Monday, Joanna and Wanda spent the morning with Carolyn. Very good day for this two ladies from Lockwood, MO. They both have fly fished for many years and love it. They both caught a lot of fish on the copper dun and P&P midges. This entry was posted on Tuesday, September 24th, 2013 at 9:22 am	and is filed under Fishing Reports. You can follow any responses to this entry through the RSS 2.0 feed. You can leave a response, or trackback from your own site.